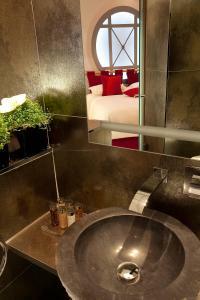 Secret de Paris - Design Boutique Hotel is located in Paris, between Montmartre and Opera Garnier. 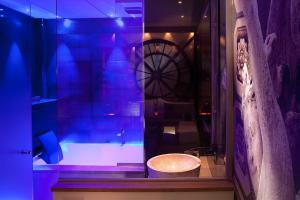 It offers luxurious, boutique-style accommodation and facilities such as a sauna, hammam and fitness centre. 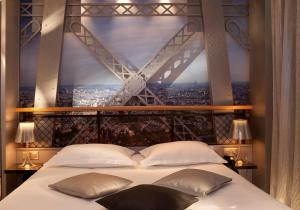 Each of the stylish soundproofed guestrooms is individually decorated, inspired by different monuments and areas of Paris. 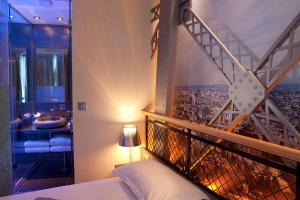 They are equipped with mood lighting, a flat-screen TV and free Wi-Fi. 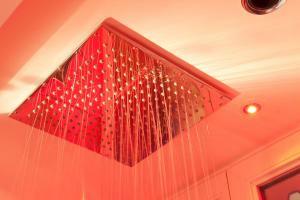 All rooms have either a hydro-massage bathtub or a rain shower. A buffet breakfast is served in the breakfast room or in the comfort of guest rooms. Guests can also enjoy a drink at the hotel's bar and discover the homemade cocktails. 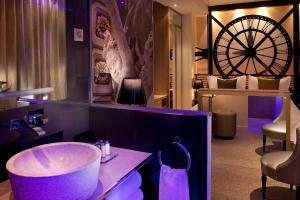 The Secret de Paris is 450 metres from Montmartre and 550 metres from Saint-Lazare. Place de Clichy Metro Station is 240 metres from the hotel giving guests access to explore the rest of Paris. In the style of the Moulin Rouge cabaret, this room evokes the atmosphere of the famous cabaret, through red colours and art work. Rate: € 177.10 ... € 429.25; select dates below to get current rates. In the style of the 1900s, this room celebrates the Eiffel Tower with a headboard designed like the pillars of the tower and a grey carpet, it has blue lighting in the bathroom. 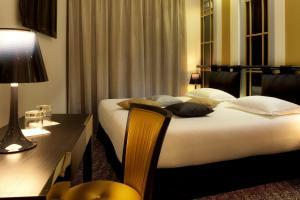 Rate: € 196.53 ... € 408.17; select dates below to get current rates. This room is designed to evoke the ballet dancing atmosphere of the Opéra Garnier, with dancing shoes and an exercise bar. The head of the bed has the oval window of the Opera building. In a 1930s-style, this room celebrates the Palais de Chaillot with stained-glass windows at the headboard of the bed and a carpet with Art Deco motifs. This is the most spacious room of the hotel and it is designed like an artist’s studio with elements to look like canvasses and gouache stains on the carpet. With decor inspired by the Musée d'Orsay, this double room has a replica of the museum's famous clock face at the headboard. 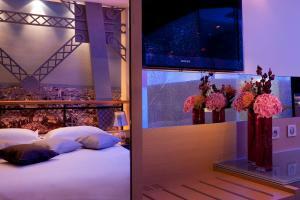 This double room has a iPod dock, minibar and satellite TV. Please note that the Whirlpool bath can contains 1 person only. Rate: € 168.67 ... € 419.17; select dates below to get current rates.